GREAT BEND, Kan. – In the first half of the double-header at SRCA Dragstrip and the NHRA Lucas Oil Drag Racing Series Cornbelt Classis David Rampy continued his winning ways with his 61st NHRA divisional event win and Mike Town and Mark Grame grabbed their second straight wins at SRCA. Eliminations for the second half of the double-header and the Thunder on the Plains are today (Sunday) at SRCA Dragstrip. David Rampy, Piedmont, Ala., ’32 Bantam, A/EA, 7.631, 152.50 def. Matt Harris, Bellevue, Neb., ’10 Colbalt, D/A, 8.770, 125.90. Mike Town, Paola, Kan., ’84 Regal, GT/OA, 10.805, 119.73 def. Jason DeForrest, Andover, Minn., ’05 Cavalier, GT/FA, 9.457, 131.93. Paul Merolla, Papillion, Neb., ’66 Chev II, E/S, 10.937, 119.71 def. Norman Warling, Golden, Colo., ’62 Catalina, M/SA, foul. Butch Kleewein, North Platte, Neb., ’13 Camaro, 10.116, 155.35 def. Tim Nicholson, Concordia, Kan., ’67 Camaro, 10.044, 99.33. Rodger Sauder, Sidney, Neb., ’72 Barracuda, 11.057, 148.41 def. Brad Frederick, Bassett, Neb., ’62 Falcon, 11.011, 149.76. Monte Weaver, Lubbock, Texas, ’63 Corvette, 6.590, 185.77 def. Todd Stallbaumer, Seneca, Kan., ’90 Camaro, 7.611, 180.67. John Fitzpatrick, Wichita, Kan., ’05 Hayabusa, 8.519, 146.27 def. Robert Williams, Ellinswood, Kan., ’09 Hayabusa, 8.881, 146.50. Trevor Larson, Starbuck, Minn., ’08 Daren Erickson, 10.088, 161.02 def. Chris Bishop, Grand Rapids, Minn., ’05 Don Davis, 10.025, 150.73. Dave Ash, Victoria, Kan., ’92 Camaro, 11.042, 142.40 def. Dan Smith, Buffalo, Minn., ’67 Camaro, 11.033, 147.34. DragChamp is your source for NHRA Lucas Oil Drag Racing Series results, news, and updates. 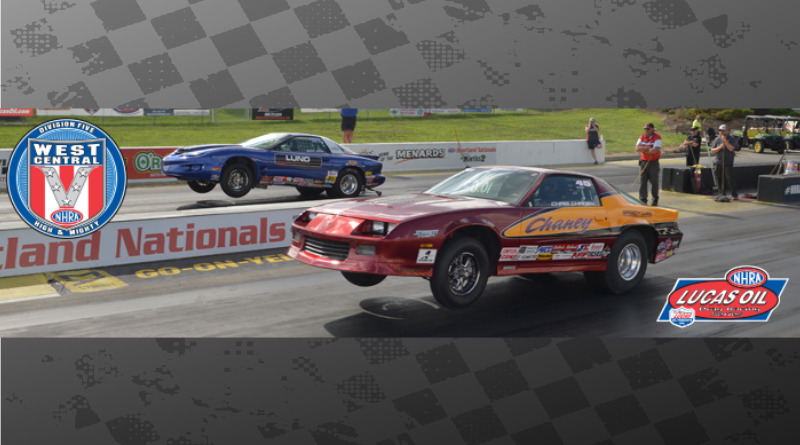 Visit Drag Champ online for NHRA drag race results.